Reframing Japanese Cinema provides a comprehensive and varied perspective on Japanese cinema through a series of essays on a director’s signature style (authorship), culturally representative film genres, and historical evolution of the Japanese film industry. Of the three sections on Authorship, Genre, and History, the articles on Authorship provide the most revealing insight into the evolution of Japanese film. 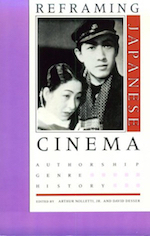 Articles are presented for Heinosuke Gosho’s Woman of the Mist, Kenji Mizoguchi’s Life of Oharu, Akira Kurosawa’s Ikiru, an overview of themes of Nagisa Oshima, and an examination of the narrative structure in Yasujiro’s late films (Late Spring, Early Summer, Tokyo Story, Early Spring, Equinox Flower, Late Autumn, End of Summer, An Autumn Afternoon). Heinosuke Gosho is considered to be one of the greatest Japanese filmmakers, despite his relative obscurity in the West. His shomin-geki films (everyday lives of the lower class) gracefully merge comedy and pathos, humanity and social conscience. In Woman of the Mist and Gosho and the 1930s, the author, Arthur Nolletti, Jr., explores the maturation of Gosho’s style in the 1930s through an in-depth analysis of the film, citing his use of narrative ellipses, mise-en-scene, irony and reversal of expectation, and framing and space. In Why Does Oharu Faint? 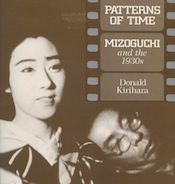 Mizoguchi’s Life of Oharu and the Patriarchal Discourse by Robert N. Cohen, the author presents an alternate, if ultimately, unconvincing, perspective on the plight of Oharu as a result of neurotic distortions from the heroine’s own flawed memory. Cohen attempts to correlate the episodes in Oharu’s life that represent her search for love as scenes that repeatedly show her objectification, and concludes that her fainting at the end of her narrative flashback was a culmination of her own subconscious anxieties over her identity and perception of independence. David Desser’s essay, Ikiru: Narration as a Moral Act, proposes that the mastery of Kurosawa’s early humanist drama rests, in part, due to the director’s successful reworking of styles, themes, and images previously developed in Rashomon. Citing the use of multiple narrative perspective and the consequent actions of the elder protagonist (Takashi Shimura) in both films, Kurosawa’s thematic approach to Ikiru becomes a recurring exploration on how a human being can conduct his life in a world devoid of absolute truth, when only death is certain. The essay, Oshima Nagisa, or The Battered Energy of Desire by Max Tessier traces the turbulent career of Nagisa Oshima through his rebellious, provocative, and idiosyncratic films, and provides a fascinating discourse on the evolution of Oshima’s style. Profoundly influenced by the French new wave, Oshima filmed Night and Fog in Japan, (an homage to Alain Resnais Night and Fog) that featured a Resnais-influenced, complex narrative structure to document an episode of political embarrassment in Japanese history. In the lean years that followed Oshima’s ouster from the Shochiku Company, he created a still photograph montage film entitled Diary of Yunbogi, which presented the audience with another provocative issue: the status of Korean minorities in Japan. In Violence at Noon and his subsequent masterwork, In the Realm of the Senses, Oshima further pushes the envelope of provocative filmmaking by exploring the psychological interrelation between sexuality and violence in crimes that evolve out of the protagonist’s mental aberration of “uncontrollable necessity”. Kathe Geist’s essay on Narrative Strategies in Ozu’s Late Films examines the seemingly incidental and mundane scenes of Ozu’s mature films (characterized by minimal plot and limited social interaction outside of the family home, office, or local bar). Geist argues that Ozu’s particular attention to seemingly inconsequential events, while, at the same time, providing cursory introduction to significant characters and events, do not reveal an inconsistency in style, but rather, serve to foreshadow the eventual narrative and thematic development. In essence, by varying the shot length of specific events, Ozu concurrently reveals the relative importance of the episode to the eventual outcome of the film.